Durable road bars made from 6061 aluminum, which comprises aluminum, magnesium and silicone. This combination is proven to increase strength to maximise every ounce of energy, while reducing weight for faster riding. Oversized 31.8mm diameter increases stiffness without adding weight. In turn, your muscle power is transformed into forward propulsion. Cougar Alloy Road Bar comes in three sizes – 400, 420 and 440mm – suit every size of rider and every style of riding. 78mm reach and 125mm drop is designed for a comfortable, sustainable position. Drops also feature a new triangular design for improved grip, more comfort and better handling. 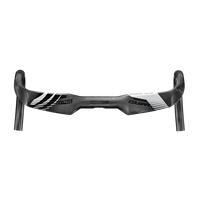 • Compatible with Shimano’s new Di2 junction box for a tidier, more aerodynamic finish. Weighs 310g (for the 420mm version). Delivery takes between 5 to 14 days depending on your location. Please contact us if you require a faster service as we can upgrade to fast courier service for an additional fee. For the items that are in stock, we can ship them to you within 24 hours. If your order for items that are not in stock, we will advise you of when we can deliver, as soon as the manufacturer or a distributor informs us. Please note that CT Sports International is not responsible for any import duties or additional expenses beyond the shipping costs to your nominated address. All purchases are billed in TWD (NT$, New Taiwan Dollars). Alternative currencies shown are for your convenience only and may vary significantly from day to day. We cannot guarantee the accuracy of displayed non TWD prices. Thus please check the actual price in your currency by converting the TWD price shown for the product(s) of interest, before you make the purchase. Credit card. We use the government owned National Credit Card Center of Taiwan to process the credit card payments. We do not store your credit card information on the Cycle Taiwan Shop site. To pay by credit card, select "Credit card" during checkout and follow the prompts. Please also ensure that you have your 3D Secure or Verified by Visa information ready as many credit card providers now require this information for online payments. PayPal. We are a verified business member of PayPal, therefore all your purchases are protected by the PayPal guarantee! If you have or want to create a PayPal account, this is the easiest way to make a payment. Just select PayPal during checkout and you will be taken to the PayPal site where you will make your payment. Every time you purchase something at Cycle Taiwan Bike Shop, you will receive reward points that you can use towards your future purchases. The points do not expire, and can be used to top up your cash payment, or to purchase products outright. You purchase a wheelset for $400. You have already accumulated 1000 reward points from your earlier purchases and choose to use them towards the $400 cost of the new wheelset. You submit 1000 reward points during checkout and instantly get a $20 credit giving yout the final checkout value of $380. An instant saving of $20!